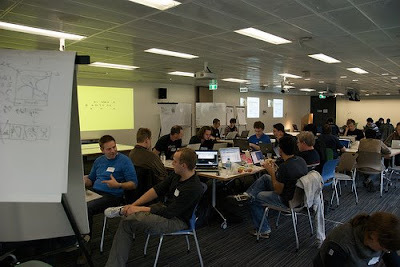 Here in Google's shiny new Sydney office, we recently hosted the first hackfest for OpenAustralia.org. OpenAustralia takes the data from Australia's record of Federal Parliament speeches, the Australian Hansard, and makes it easy for people to follow topics they're interested in. Back in 2004, Matthew Landauer and Katherine Szuminska found themselves at the launch of the UK site TheyWorkForYou.com, a website designed to allow the average person to quickly and easily search the United Kingdom's Hansard - the record of all happenings in Parliament. 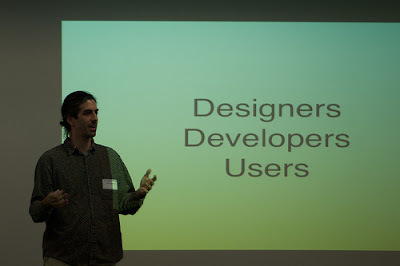 Their work blossomed and they were inspired to make a similar site happen in Australia, OpenAustralia.org. Both websites give ordinary people, who often have no idea who their local representative is, let alone what their representative has been doing on their behalf, the ability to track topics they're interested in and find out exactly what their representatives are doing. When Matthew emailed out asking for a location for a place to host a hackfest, we were very happy to lend a helping hand. 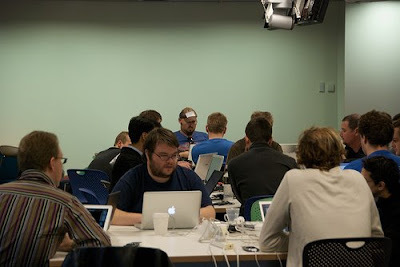 The hackfest ran on Saturday the 13th of June at the newly opened Google offices in Sydney, Australia and was successful beyond anyone's expectations. When originally announced, the event's original 25 attendee slots filled so fast that we ended up increasing the number to 50 (which also filled remarkably fast). More surprisingly, almost everyone turned up and we even had a number of attendees fly in from other Australian states. No one expected this level of enthusiasm from the community, and we were pleased to share in everyone's excitement. Some cool outcomes include a tool for crowd sourcing transcription of the "register of member's interests", an API and datasource for mapping street addresses to representatives, a "FixMyStreet" iPhone App and numerous bugs on the site fixed. More information on these and the ongoing efforts of this community can be found on the Open Australia Development list. Matthew was also gracious enough to give a tech talk for Googlers about some of the many challenges faced by creating such a site, e.g. dealing with Crown Copyright, problems with getting a clean source of data, and problems getting the data fixed when it's clearly in error. Enjoy!